I love when I come across a utilitarian brand like Ray Ban which, despite selling a product that doesn’t naturally lend itself to content creation (who wants to read dozens of articles about sunglasses? ), has a content marketing strategy that is engaging, memorable, and, more or less, killing it. The trick? Excellent storytelling that aligns the brand with the target market’s deeper interests. Or — in Ray Ban’s case — using music, architecture and the human experience to sell sunglasses. 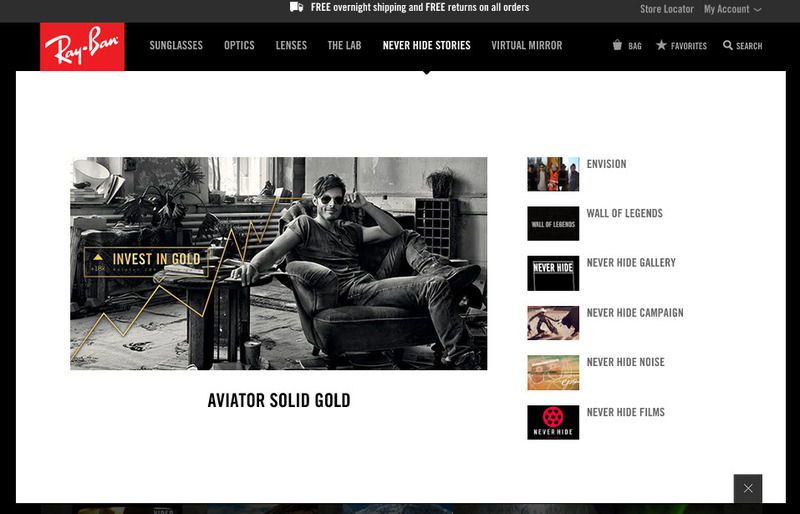 Here are two takeaways from Ray Ban’s content marketing strategy that we can all learn from. If you want your content to be remembered you have to spark an emotional response. To do this you need to pick a target market, get to know them inside and out, and then align your brand with your target market’s deeper interests. And not just what do they want content wise. The trick is to think beyond that. What do they want out of life? What do they want to do on the weekend? What do they want to wear? What do they want to know more about? What do they want to be when they grow up? To tap into their market’s inner desires, interests, and wants, Ray Ban has aligned itself with an overarching theme that allows them to use content that has nothing to do with sunglasses to sell sunglasses. It sounds crazy, but when done right – as Ray Ban has done – it really works. For Ray Ban, the overarching theme that associates them with the inner desires of the market is “Never Hide.” Which – in addition to “be an extrovert and show off how awesome you look in those sunglasses” – they translate to mean be yourself; tell your story; “stay true to your vision” and find your “purpose in life” as they put it in one landing page. This theme is emotive, memorable, and the heart of what makes it possible for Ray Ban to use engaging stories about architects to keep consumers on their website. It’s the embodiment of them reaching beyond the surface level – beyond “wear sunglasses!” – to get in touch, deep down, with what really motivates their market. Ray Ban has done an excellent job aligning their brand with the art of storytelling. They’ve even used the word “stories” to describe the content section they’ve created on their website in lieu of a blog. Through associating with these characters and stories (both real and fictional), the personality of the characters and the qualities of their stories naturally contribute to the collective story of Ray Ban. At BCI, we know how to grow our clients’ online presence and revenue. To explore how we can help you, request a conversation or call us today at 866-517-1900. 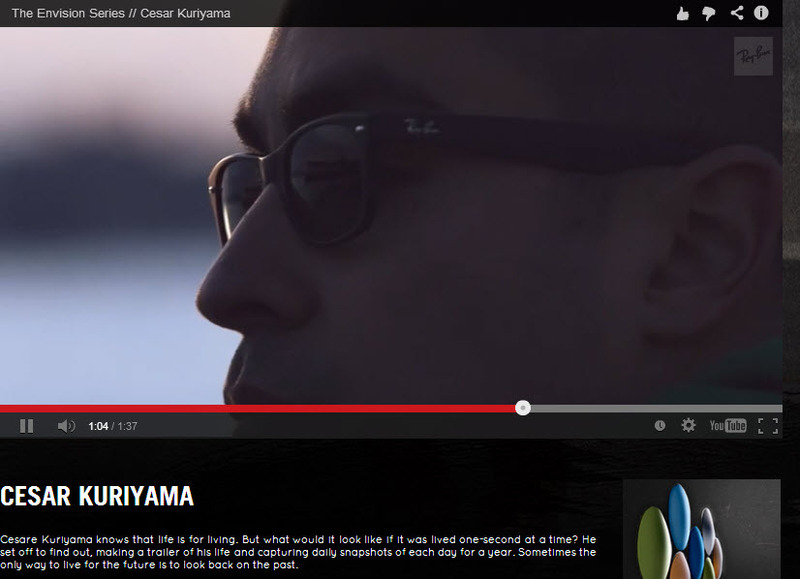 Ray Ban has included the story of iPhoneographer Cesar Kuriyama on their website. It’s pretty cut and dry; Cesar talks about what motivates him and what he finds interesting, and Ray Ban edits his story into a 1.5-minute YouTube video. The video ends with the words “Never Hide” and the Ray Ban logo, and in the video Cesar wears Ray Ban sunglasses while he does his thing. Cesar is cool, forward thinking, inspired, inspiring, which — since they shared his story on their website — makes Ray Ban cool, forward thinking, inspired, and inspiring by association. By using Cesar’s story as support for their overarching theme, Cesar’s story then becomes part of Ray Ban’s story. And since Cesar’s story is memorable and emotive, Ray Ban’s story becomes memorable and emotive. Replace Cesar with Ray Ban’s Polarized concert series and its associations, a fictional character from one of their Never Hide print campaigns, or any one of the Ray Ban followers who have submitted user generated content and you get the same effect. The stories told through Ray Ban become part of the collective Ray Ban story. Really, It’s Not about the Product. It’s about Building a Story Around the Product. Ray Ban doesn’t have a blog. They don’t write 300-1000 word articles that include keyword phrases. They don’t really write about sunglasses, even. They don’t create this kind of content because that isn’t the type of content that keeps their audience engaged. It’s all goes back to aligning the content you create with the needs of your target market and their deeper interests. Remember: Your product is not just sunglasses, or baby food, or toilet paper, or car insurance, or online marketing. Find your target market’s deeper purpose, and don’t be afraid to let the community who represents those interests help you tell your brand story. It’s working for Ray Ban. Bruce Clay literally wrote the book on content marketing. We’d be happy to hear about your business challenge and see if our consulting fits your needs. Why not fill out a request and start the conversation today. Spook — The key takeaway of this article is a need to really KNOW your target market beyond the surface level. What motivates them? What gets them talking? What inspires them to get up in the morning? Any size business can (and should!) apply this to their strategy regardless of allotted budget. It costs a lot of money to run an event, but it’s can be totally free to investigate the deeper desires of your target market and then align your brand with them. The latter is all a matter of drive and creative thinking. Wow! At first, I already considered Ray Ban as one of the nicest companies for eyeglass products. I never thought that they could level up for the sake of having more and more customers. They really did a great job but you have to have lots of budget for this. How will this one work with small businesses?